While designing the theme for Amigalog.com I decided to include all the Amiga logos inside the page layout: the typeface logo, the rainbow check mark and the unofficial Boing Ball. For the typeface logo I used the Bodoni font[a], the closest font to the one used in the original Amiga logo that I could find on the web. I found easily the rainbow check mark (which I used as a check mark for the floppy-shaped main menu on the right side) and the boing ball, but for the boing ball I wanted an animated gif, thus I decided to create a rotating checker ball in Blender[b]. The Boing Ball logo comes from the first Amiga Demo, created for the Consumer Electronics Show of 1984, featuring a rotating checkered bouncing ball. You can read the full story of this Demo here inside the great History of the Amiga series published on Ars Technica which I linked in this post. Creating a rotating checkered ball with Blender is very easy. 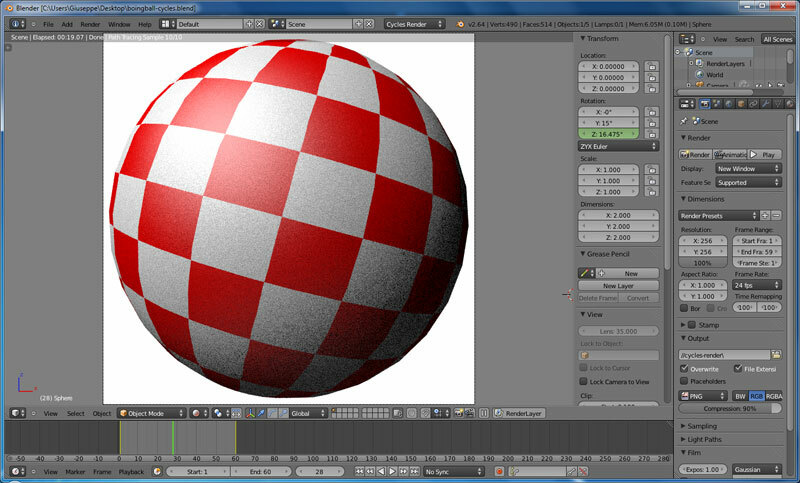 I first created a sphere, then applied to its material a checker texture using a tube projection. I adjusted the mapping matrix by tuning the X and Y size parameters to get a correct size for the checkers. I finally added a light, positioned the camera and animated the sphere Z axis. I used a 36 degrees rotation, after which the checkers position repeats. I created also a second version of the Blender project using the new blender render engine: cycles. When working with cycles, you can use a certain number of procedural textures. I used the checker texture which is perfect for the boing ball. Unfortunately the version of Blender that I’m using at the time of writing (2.64) doesn’t have the tube projection feature for the cycles engine. Thus I had to create an UV map which had some problems around the poles. Fortunately this was not a problem cause the poles are not visible in the final animation. Once I created the Boing Ball animation in Blender, I exported all the animation frames as png images with transparent background. Now it’s time to pack all the frames into an animated gif. For this task I used the great ImageMagick[c] suite of tools. echo Adds a background color (color format: rrggbb) to all the pngs in srcdir and saves result in destdir. echo Creates an animated gif from pngs in framesdir directory. echo - ncolors: number of colors of the destination image. GIF format can have a maximum of 256 colors palette. 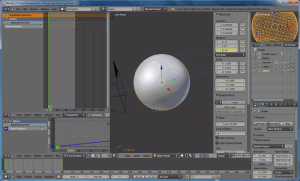 This entry was posted in Graphics, Scripting and tagged amiga boing ball, animated gif, blender, imagemagick on November 25, 2012 by Giuseppe. Pingback: Xamarin Recipe Cook-off: Using SpriteKit on iOS7 with C# | Just Krumelur.